Well, everyone knew but no one was talking. You’d have never known Shelly Silver had any money. While the disgraced Assembly speaker is accused of raking in millions of dollars in bribes and kickbacks, he’s lived a low-key, modest lifestyle — never leaving his boyhood Lower East Side neighborhood. Silver’s thrifty spending habits might be why federal authorities were able to seize those funds from eight of his accounts at six separate banks. The Orthodox Jewish assemblyman still lives with his wife, Rosa, in a Lower East Side co-op apartment at 550 Grand St., which is just blocks away from the apartment he grew up in. He’s a fan of cheap haircuts at Astor Place Hairstylists — and insisted on driving his own car around when the Assembly was in session. 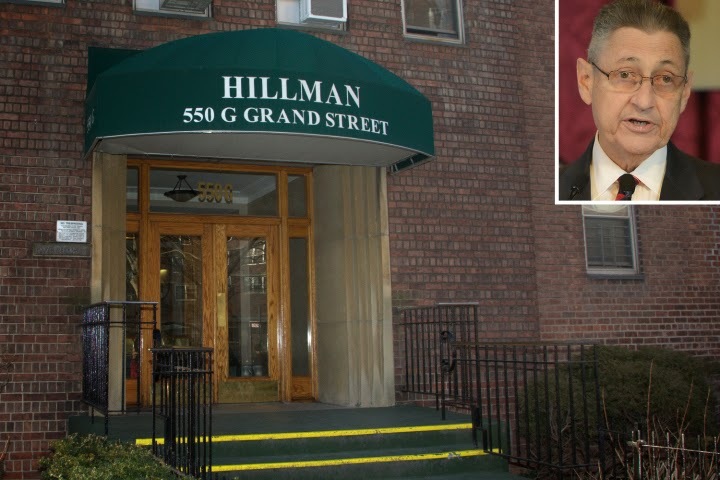 When Silver, 70, moved into the Cooperative Village’s Hillman Houses many years ago, his apartment was a “limited dividend co-op,” meaning it merited some serioustax exemptions in exchange for price regulations. Back then, they might have paid less than $10,000 for the property — but its sale price is likely now $500,000. Silver and Mrs. Silver, who used to work as a special-needs schoolteacher at PS 199, own just one vacation property together — a country getaway in the Catskills they bought for $106,000 in 1990, records show. That was before he became speaker in 1994. Silver also found creative ways to rack up free frequent-flier miles by using taxpayermoney to take detours through Philadelphia and Washington, DC, during his regular flights from New York City to Albany. By turning the 150-mile trip into a 500-mile journey, Silver may have earned 205,834 frequent-flier miles with the scheme — enough for a free trip around the world. He’s also been known to stay at inexpensive motels “to maximize his per diem” — and put the remainder in his pocket. A Post reporter found Silver in 2011 at the Red Carpet Inn on the outskirts of Albany, where rooms go for as low as $45 a night. The speaker, however, had a lucrative association with the law firm Weitz & Luxenberg and owns stocks in more than 70 firms, including Anheuser-Busch, Facebook and Citigroup, according tofinancial statements released in 2013. He also put some of his cash in a venture-capital fund, Lerer Ventures, that financed the BuzzFeed news website. He planned to retire with between $1.78 million and $2.32 million in his retirementand deferred compensation plans.